The American city of Anchorage, Alaska is recovering from a powerful earthquake Friday that damaged public buildings, homes and roads. The 7.0 magnitude earthquake caused buildings to sway. But there have been no reports of deaths, serious injuries or widespread damage. 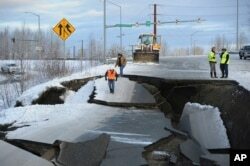 Officials at the Port of Anchorage say the quake has not interfered with transportation of food and other supplies. “The ships are coming in on schedule, the supply lines are at this point uninterrupted,” Anchorage Mayor Ethan Berkowitz told reporters Sunday. The scenic Glenn Highway was probably the road hit hardest by the earthquake. It links the state’s largest city to communities in the north. Traffic has been heavy and slow-moving since the quake. Drivers are being redirected around road damage. Work crews are trying to rebuild areas where the quake created large holes in the road or caused other damage. Falling rocks also are a danger on some roads. Workers inspect an off-ramp that collapsed during a morning earthquake, Nov. 30, 2018, in Anchorage, Alaska. Residents still nervous after the major quake have been upset further by more than 1,700 aftershocks. Several have measured 4.5 magnitude or greater. "Anything that moves, you're on your last nerve," said Anchorage resident Lyn Matthews, whose home suffered structural damage, including a sunken foundation. Alaska put in place strict building rules after a 9.2 earthquake in 1964. That was the second most powerful earthquake on record. Federal officials declared a public health emergency on Monday to guarantee that federal medical assistance money will continue. Mental health aid is also available for people traumatized by the disaster. Earthquake experts say there is a 4 percent chance of another earthquake with a magnitude of 7.0 or greater in the first week after the first quake. "The chance is very small, but it's not impossible," said U.S. Geological Survey Geophysicist Paul Caruso. The Associated Press reported this story. Caty Weaver adapted it for VOA Learning English. Caty Weaver was the editor.